An agricultural show had to be abandoned in Powys after a marquee collapsed in high winds. 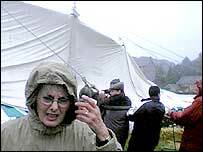 Dozens of people were forced to flee after the 240ft long tent at the Sennybridge Show, keeled over. Craft items, horticultural and household produce were damaged. "Very luckily there were no casualties but inevitably people have suffered a loss of stock," said Gethin Havard, chairman of Sennybridge Agricultural Society. Up to 2,000 people were estimated to be at the show on Saturday lunchtime. Mr Havard said it was decided to abandon the show for safety reasons. "My three daughters were in the tent awaiting the results of judging and before they knew it, the canvas was coming down." Mid and West Wales Fire Service were quickly on the scene and said crews managed to make the collapsed tent safe and left the scene at just after 1500 BST. Craft stall holder Harriet Jones said: "It was complete chaos - one man was trapped under a table but people managed to get out." Miss Jones, with an arts and craft group from Mumbles, Swansea, added: "I grabbed what I could, luckily I have small items - jewellery - which I managed to wrap up, but there were crafts people with items like porcelain who lost stock." Show organisers say they will investigate what happened but said the winds did not appear exceptionally high at the time. 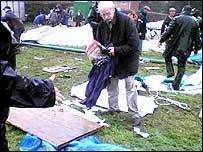 A small tent being used by the Army was also blown over. 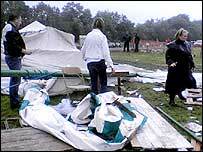 In another tent, the show's lunch was abandoned with wine bottles opened, after the showground was evacuated.